Using satellite altimeter data for more than 20 years, the Japanese researchers have achieved many descriptive physical oceanographic results in the western North Pacific and surrounding marginal seas. The efforts of the Japanese researchers have been extended to understand oceanic variations of sea surface height (SSH) and flow fields in those regions. In addition to these scientific researches, operational ocean data assimilation systems has been developed in some Japanese agencies. Whereas, JAXA, Japanese space agency, has been developing collaborations with Japanese ocean-related researchers and users in recent years. One of the collaborations is a feasibility study of a new type Japanese altimeter mission, COMPIRA (Coastal and Ocean measurement Mission with Precise and Innovative Radar Altimeter). COMPIRA is a wideswath and high resolution altimeter using X-band interferometric synthetic aperture radar. As well as SWOT, COMPIRA is expected to compliment conventional altimeters which have spatial-temporal sampling restrictions. Therefore, similar researches are commonly required both for SWOT and COMPIRA on wide-swath SSH mapping and small-scale oceanic phenomena. In this context, this proposal has been coordinated by JAXA in cooperation with the Japanese researchers. SWOT is expected to observe two-dimensional small-scale SSH features that have not been observed so far by conventional altimeters. Such observation by a wide swath altimeter is new for oceanography and we have not yet had calibration and validation methods for such small-scale observation. It is necessary to establish other observations of similar features before the SWOT launch, such as HF radar and in-situ observation methods. The use of data from other sources would provide additional information that cannot be obtained with SWOT alone, such as duration of phenomena, vertical structure, current velocities including ageostrophic components and relations with biogeochemical phenomena. Because the small-scale SSH features will be different from those of geostrophic SSH in terms of spatio-temporal scale, the same data assimilation algorithms for conventional altimeter data may not be adaptable to the SWOT data. In this proposal, based on our experience in observations and assimilation mainly in the western North Pacific and surrounding marginal seas, we will develop new observations for small scale features, calibration and validation methods for SWOT, and SWOT data assimilation methods. SSH measured by a real-time kinematic (RTK) GNSS (Global Navigation Satellite System) receiver mounted on a ferry revealed significant small-scale undulations with wavelengths of the order of 10 km, which are possibly related with ageostrophic processes (Figure 1). Since scales of ageostrophic process are generally small both in time and space, cal/val of the SWOT data requires to obtain the two-dimensional reference SSH field with a reasonable spatial resolution and acceptable temporal lags. Figure 1. 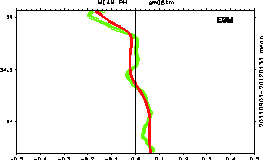 Left: The 5-month mean SSDHs determined by RTK GNSS (green) and ADCP (red). Right: The temporal anomaly SSDH components on 04 Dec 2011. Figure 1. Top: The 5-month mean SSDHs determined by RTK GNSS (green) and ADCP (red). Bottom: The temporal anomaly SSDH components on 04 Dec 2011. New cal/val methods for the SWOT snapshot SSH field are being developed. The most certain way to obtain snapshot SSH field is to deploy multiple quasi-stationary SSH observation platforms. Accounting the ability of the RTK GNSS system on the Ferry "New Camellia" to measure SSH, a similar RTK GNSS system is newly installed to a surface drifter, which can be deployed to any place for a short period. Its accuracy and stability of SSH measurements against pitch and roll motions of the drifter caused by surface waves is to be investigated. 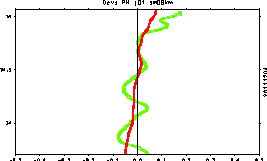 One of the crossover points of the 1-day repeat 90-day cal/val phase is set in the Japan Sea (Figure 2). We plan to utilize this site for cal/val activity in Japan. Figure 2. 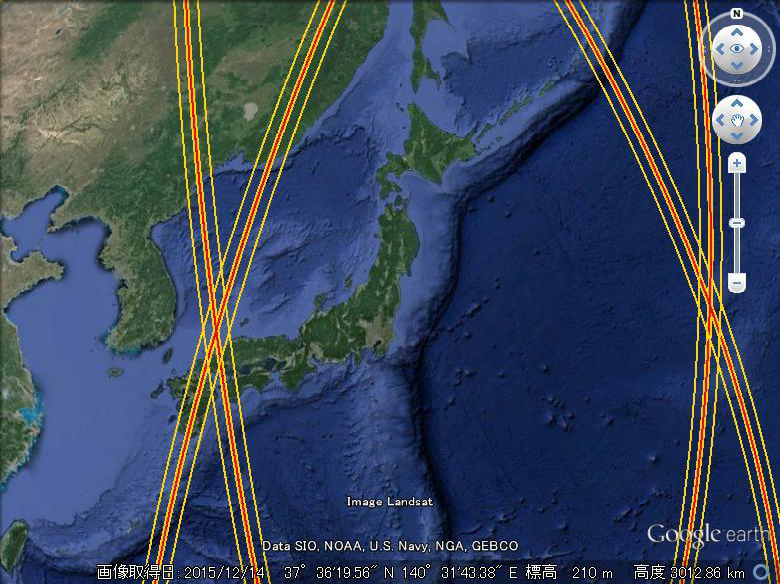 Ground tracks of the 1-day repeat cal/val phase around Japan. Figure 3. Daily mean of sea surface current anomaly from long term mean in the northeast of Taiwan observed by the Long Range Ocean Radar. Thick lines denote satellite tracks of Jason-1 and Jason-2, and thin lines denote bottom topography. Color tone indicates current speed. Comparisons between HF radar currents and conventional altimeters revealed that coastal altimeter data include small-scale noises that does not contributes to the geostrophic velocity and HF radar may include significant ageostrophic components that would not be represented in SSHA (Figure 3). By using HF ocean radars and in-situ measurements including shipboard, moored and bottom-mounted ADCPs, drifting buoys, hydrographic surveys, and coastal tide gauges, we will investigate the quality of coastal altimeter products and influences of ageostrophic current components in the coastal regions around Japan. These investigations would reveal how the coastal SSHA corresponds to geostrophic velocity components and how the ageostrophic velocity contaminates the coastal SSHA. In-situ ship observations can capture a small -scale (smaller than 1 km) phenomenon at the sea surface continuously along the cruise track. In addition, an underway CTD equipped to an observation ship enables direct observations of subsurface structures of mes oscale to sub-mesoscale phenomena with nearly 1 km resolution. Recently, biological underway CTD was developed and Chl-a distribution is also available. Underwater gliders are more stirless equipments which can observe undisturbed water structure from surf ace to 1000 m depth (Figure 3). By using high-spatial-resolution maps of Chl-a and sea surface height, in-situ ship observation data (including underway CTDs) and underwater glider observations , we are going to investigate the small -scale ocean physics such as mesoscale eddies, fine -scale fronts, filaments and so on, and their effects on ecosystem/biogeochemical processes. Combining sea surface continuous water sampling, underway CTD and underwater gliders, we are now trying to slice the small -scale ocean phenomena. 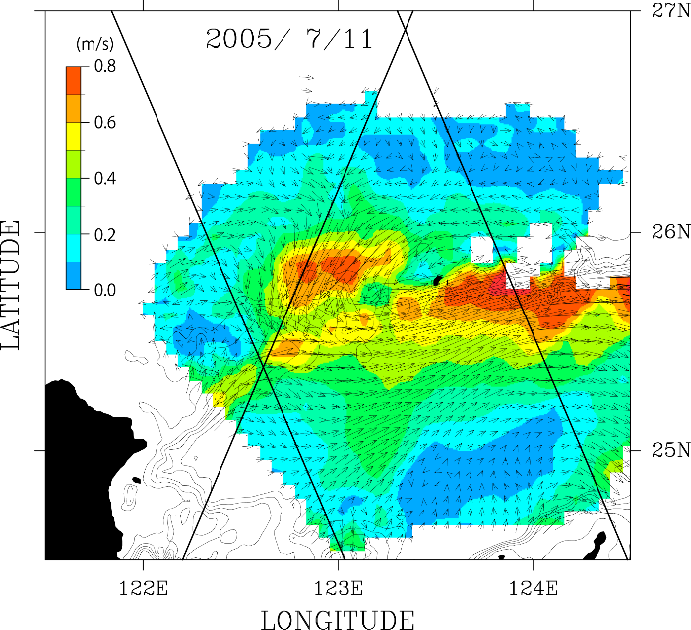 Intensive observations of upper ocean conditions in the Kuroshio Extension region and a surrounding area will be conducted to obtain three-dimensional structures of the interleaving and associated mesoscale and submesoscale variability. Detection scheme of submesoscale variability from the profile data will be developed. This new scheme will be applied to all the available temperature and salinity profiles of Argo floats and glider observations to examine spatial distribution and three-dimensional structure of the interleaving in other regions. Satellite data are used to relate these information to the mesoscale and larger scale phenomena. A non-hydrostatic high-resolution model is utilized to simulate upper-ocean conditions, including submesoscale phenomena and interleaving structures, with idealized and realistic boundary conditions (c.f. Klein et al., 2008). Structure of the interleaving in the model is compared with the observations, and detailed relations among the interleaving, mesoscale and submesoscale phenomena, and SSH variability will be studied. 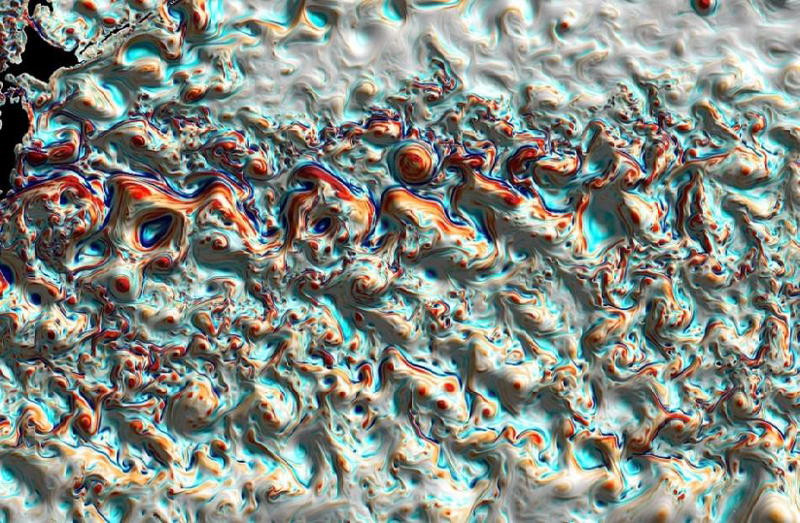 Results from a high-resolution, hydrostatic ocean model, which captures realistic submesoscale structures in the North Pacific (Figure 4), are used for boundary conditions of the realistic simulation. 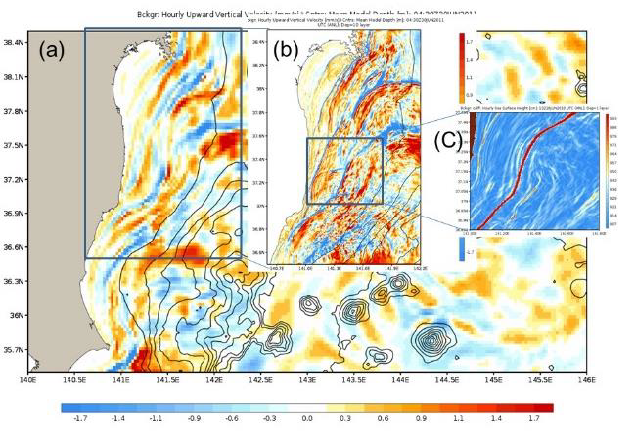 The results from the hydrostatic model are also utilized to investigate relations between submesoscale phenomena and much larger scale variability, such as mesoscale eddies and meandering of Kuroshio currents. Figure 4. Surface relative vorticity (color) and SSH (relief with shade) in Kuroshio Extension region in winter (March 15, 2002) simulated by a high-resolution North Pacific model. Eddies with red (blue) color and high (low) SSH corresponds to warm anticyclonic (cold cyclonic) ones. This aims to estimate SSH variability and its related error structure caused by internal tide and inertial motion that could affect estimation of mesoscale and submesoscale SSH variability using wide-swath ocean altimetry measurement. We utilize the SWOT simulator (Gaultier and Ubelmann, 2015) to sample pseudo-SSH anomaly representing the internal tide and inertial motion from number of simulation products created by a high-resolution tide-resolving ocean general circulation model (JCOPE-T; Varlamov et al., 2015). Our JCOPE-T simulation reasonably represents the internal tide related SSH variability and downscaling is effective for refinement of internal tide signals (Figure 5). Figure 5. (a) A snapshot of JCOPE-T (1/36 deg. grid) vertical velocity (in mm/s) at a sub-surface level mainly representing internal waves. (b) Same as (a) except for a zoom-up view of a square region in (a) of a downscaled (250m grid) model. (c) A zoom-up view of SSH gradient (in cm/grid) in a square region in (b). We compare pseudo nadir and wide-swath measurements to carefully evaluate possible difference in the internal waves related error structures between the two type’s measurements. We will design the error covariance matrix based on the pseudo SSH anomaly, implement it in an ensemble Kalman Filter system (Miyazawa et al., 2012; 2013), and examine the reproducibility of the mesoscale and submesoscale signals obtained from the SWOT type measurements. Although the satellite altimetry data allow us to provide effective products on oceanic meso-scale features, it is still demanded by users to improve their accuracy, particularly in coastal areas. Assimilating high-resolution sea level data observed by SWOT is a strong candidate for the improvement. In order to confirm its effectiveness, we plan to develop procedures for assimilating the SWOT data in data assimilation systems for the western North Pacific and Japanese coastal areas, and to perform observing system simulation experiments (OSSEs) using pseudo observation data generated from independent data-assimilative fields. Here, we will pay attention on the difference in the measurement error characteristics between conventional altimetry data (e.g., TOPEX, Jason-1, -2 etc.) and the SWOT data. Conventional altimetry uses only a single nadir sensor, and therefore the error statistics is relatively homogeneous. In contrast, SWOT measures the seal level by the combination of a nadir sensor observing absolute values and synthetic aperture radar (SAR) sensors observing relative values. Therefore the error statistics of SWOT data is inhomogeneous and complicated. In addition, closer distances between data points makes it necessary to consider covariance of representativeness errors. Several possible error statistics should be tested in OSSEs. In addition, we will explore an effective method of assimilating the SWOT data with their complicated error statistics. For example, assimilation method for tidal currents and their interaction with geostrophic currents are important issue for coastal areas.